School is back in session and fall sports are in full swing. Life definitely gets busy this time of year. That's why I'm always looking for recipes to keep things #EverydayEffortless, but that I can still feel good about serving to to my family. 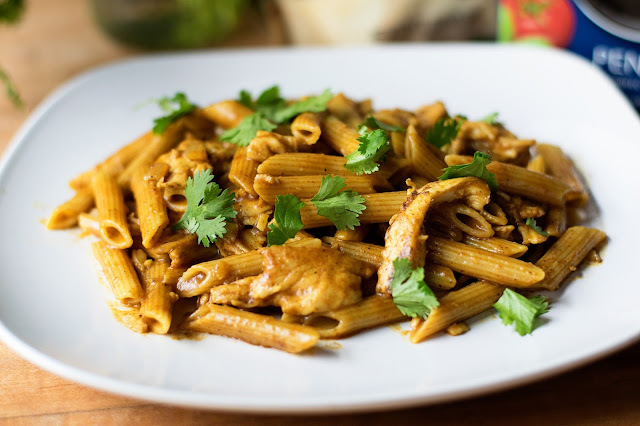 My Butter Chicken Pasta is all of those things. When keeping things #EverydayEffortless, there are two things you need to do. 1. Head to your local Walmart, where you can always find great prices. 2. 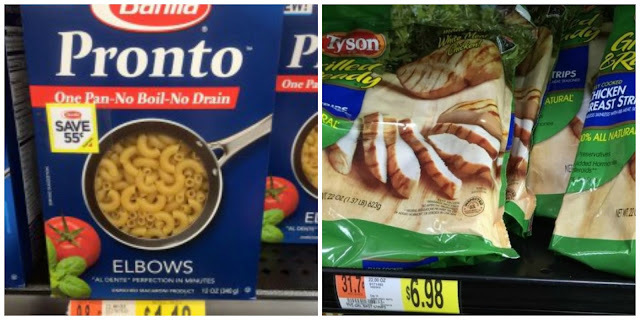 Pick up the Barilla Pronto Pasta and Tyson Grilled and Ready Chicken Strips. I can't even begin to tell you how much I love this new Barilla Pronto pasta because it requires no boiling, no draining, and is ready in 10 minutes. Tyson chicken strips are always great to have in my freezer and I love the fact that they are fully cooked, 98% fat free, and have no preservatives. Now that we have our two main ingredients, let get to cooking. 2 c. Tyson Grilled and Ready Frozen Chicken Strips. To begin you will need to place a deep skillet over medium/high heat and add 2-3 tbsp. of extra virgin olive oil. Once the pan and oil are hot, add the onion and let cook until it is soft and translucent. Next add the garlic to the pan. Cook until you can smell the garlic coming from the pan, 1-2 min. 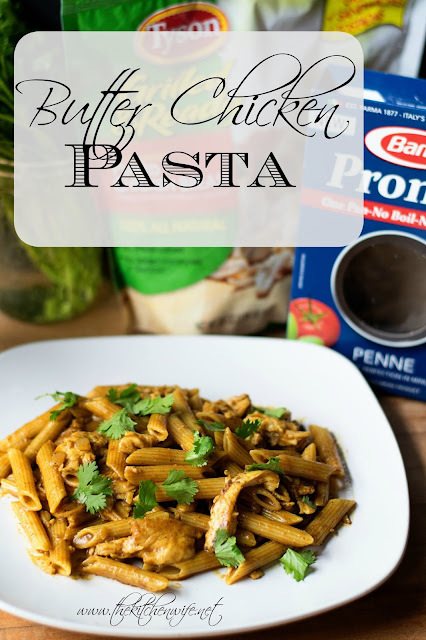 Now you can add the Barilla Pronto Penne Pasta to the pan. You can also use water here, but I think the chicken stock adds a nice flavor base to the pasta. While pasta is simmering, you can put together your sauce. And finally the extra virgin olive oil. Pour in the butter sauce. Stir it all together, cover, and let simmer for 10 minutes. In that time the sauce with thicken and the spice magic will happen in the pan. Add the butter to finish the sauce with and you are ready to serve! This meal is perfect for these cool autumn evenings! It is warm, hearty, smoky, and spicy. All things that feel like they should have been cooking all day, but your #EverydayEffortless meal only took FIFTEEN MINUTES! Top it off with a little fresh chopped cilantro, serve with a nice green salad, and you are eating! With the extra time you saved in the kitchen you can now spend some quality time around the table with your family talking, eating, and laughing. Isn't that what dinner is supposed to be about? For more of these effortless dinner click HERE. Next add the garlic to the pan. Cook until you can smell the garlic coming from the pan, 1-2 min. Now you can add the Barilla Pronto Penne Pasta to the pan. Pour in the chicken stock. Season with a little salt. Then cover and let cook for 5 minutes. Now you can assemble the sauce. Combine the coconut milk, tomato sauce, oil, garam malsala, paprika, cinnamon, turmeric, chili flak, salt and pepper, to a mixing bowl and whisk together until smooth. After 5 minutes, add the chicken to the pan with the pasta, pour in the sauce, stir, cover and cook for 10 minutes. After 10 minutes, add the butters, let melt, & top with some fresh cilantro.